Oaker Wood Leisure01568 780111work Outdoor Pursuits CentreOaker Wood Leisure is situated on the Herefordshire/Shropshire and Worcestershire border. Our world of adventurous outdoor activities is set in 175 acres of mature woodland, complete with two scenic lakes. Each activity at Oaker Wood Leisure is based in its own exclusive area ensuring you can experience the great outdoors away from the crowds. Quad Bike Endurance Trekking for both adults and children offers a unique chance to explore the forest at speed led by our trained marshalls. Paintball is another favourite activity at Oaker Wood Leisure with numerous games scenarios including Attack the Fort and Hijak the Bus. We never mix groups so you will need a group of at least 8. We also offer Junior Paintball from 8 years or Senior Paintball from 11 years. Swing through the trees on our Aerial High Rope Course or take on the challenge of our Adrenalin Experience including Zip Wire and Leap of Faith. Our Low Ropes Assault course is perfect for all ages, so whether you are organising a 6 year olds Birthday Party or a Corporate Team Away Day the tunnels, bridges and swamps of our Borneo Breakout Low rope course will have your group laughing. Raft building is a great group activity on our woodland lake where we also offer Clay Pigeon shooting. Although many of our activities require a group of 8 people we do offer Family Activities – Quad Treking, Target Shooting, Adrenaline Package, Clay Pigeon Shooting and High Ropes Tree Trekking are all available for smaller groups. In school holidays we offer Children’s Holiday Clubs – fun filled days with a range of taster activities. Oaker Wood Glamping Village, new in 2014, is set in the heart of our 175 acre Woodland Activity Site provides “Glamping” for groups of between 10 & 62 people. Accommodation is in wooden pods sleeping between 4 and 8. Each pod is nestled amongst the trees set within its own woodland bay, linked by winding paths, lit by twinkling fairy lights at night. Pods have electric lights and heaters for the colder months. At the heart of the camp area is a covered dining area. Your stay with us can be on either a catered or self catered basis, we provide all utensils and cooking equipment. New for 2014 is a barbecue hut where groups may enjoy a barbecue whatever the British weather brings us. 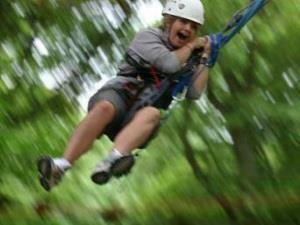 Oaker Wood Leisure is situated on the Herefordshire/Shropshire and Worcestershire border. Our world of adventurous outdoor activities is set in 175 acres of mature woodland, complete with two scenic lakes. Each activity at Oaker Wood Leisure is based in its own exclusive area ensuring you can experience the great outdoors away from the crowds. Bookings at our camp can be combined with a range of outdoor activities, all on your doorstep – quad bike trekking, paintball, high rope adventures, climbing, rafting, clay pigeon shooting, target shooting, low rope assault course and more.